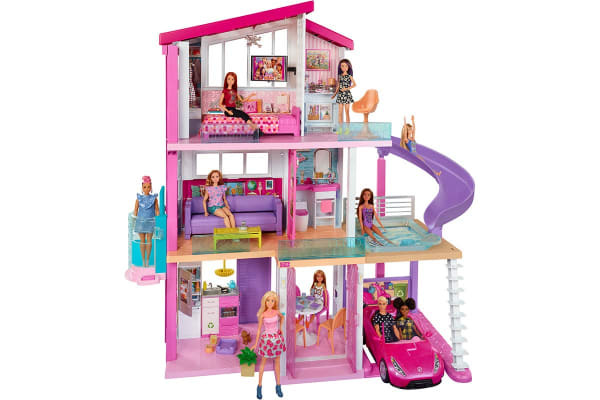 At the Barbie Dreamhouse, the pink double doors are always open for family and friends to stay and play. At the Barbie Dreamhouse, outdoors is just as much fun as indoors! Dream up all kinds of stories with three floors, eight rooms, an outdoor area, a rooftop pool and slide, a working elevator and 70+ accessories! The garage is big enough for Barbie doll to park any of her vehicles, even the camper! The first floor has a dining room and kitchen with appliances that play real sounds – the stove sizzles, the oven ticks and the kettle whistles. The second floor has a bathroom and a living room that is perfect for a slumber party (the couch transforms into a bunk bed and the coffee table becomes Kelly’s bed). 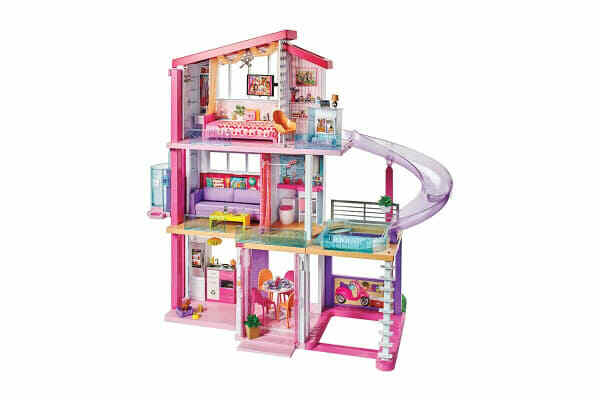 The third floor has Barbie doll’s master bedroom with her dream closet and a den that transforms into an office. Slip Barbie doll down the slide and relax in rooftop pool. Swivel the dollhouse around for an outside view and explore even more play possibilities, barbecue on the patio, stay warm at the fire pit or check out the garden. The moveable kitchen furniture transforms into outdoor furniture (the stove becomes a barbecue and the refrigerator a cooler). 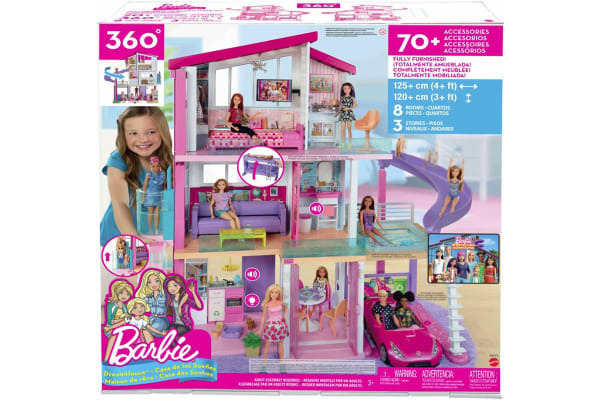 There is so much to do in the Barbie Dreamhouse with new transformation features and 360°	play!